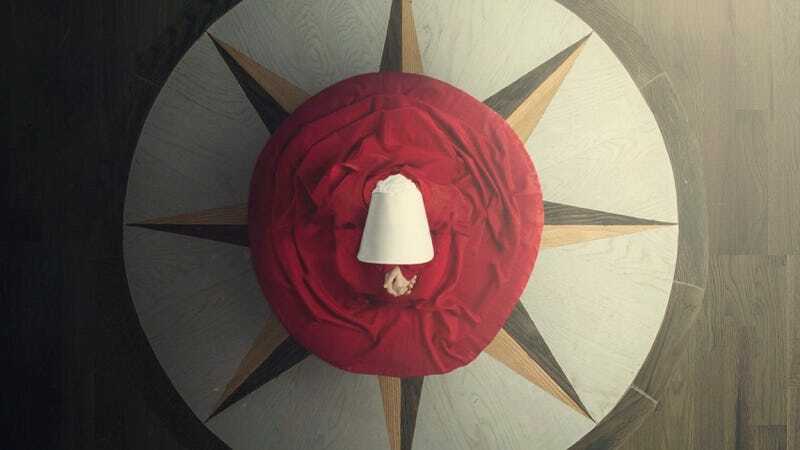 Hulu has released the first teaser trailer for The Handmaid’s Tale, the 10-episode adaptation of Margaret Atwood’s dystopian novel. In just 30 seconds, it says everything about what a beautiful nightmare this series will be. Elisabeth Moss stars as Offred, a woman struggling to survive in an oppressive, simplified society where she’s used for her fertility to aid re-population efforts. But it’s not just about the world she’s in, but also the world she’s from. The first preview shows that we’ll get a look at Offred’s past, and how it will shape her future. She was a fighter, and she will continue fighting to be reunited with her family. The visuals look gorgeous but gruesome, including a harrowing look at Alexis Bledel’s character in a face gag. Tiny downgrade for the Offred whipping scene, though, as that thing was nowhere near her face. The Handmaid’s Tale debuts on Hulu April 26. Handmaid&apos;s Tale Too Politically Incorrect For Canadian Schools?